Image mask is a means of cutting an image along the outlines of a shape path. This can be achieved in PitchPrint by placing any of the default plain shapes on the canvas an then dragging a photo unto them. The Photo fills out the shape as a mask. You can as well use your own unique SVG files for this purpose. To do this, the most important criteria is that the SVG needs to be a single path node. 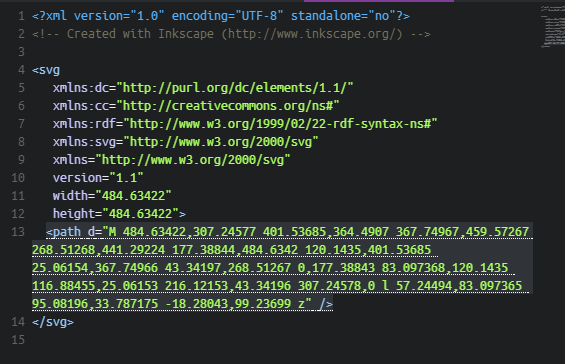 In essence, when you open up the SVG in a text editor, it should show a path element just at the base of the svg node, not enclosed in a group or other elements. To achieve this, select the shape you want to use for masking in Illustrator and convert it into a path. If you have non-touching parts, select them all and make sure they are flattened as one single element, not grouped. Select them and click Object > Compound Path > Make. Then copy the new item and open your text editor. Paste into the text editor and save the file with a .svg extension. Check the code and ensure you see it as a single path node similar the image above. Import same into PitchPrint and that should work as an Photo Mask.